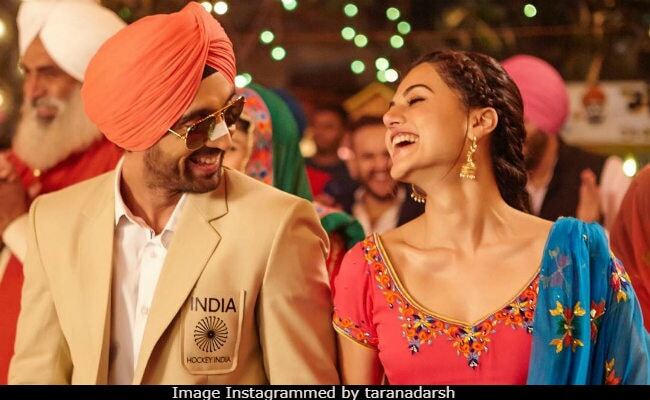 Shaad Ali’s Soorma may not be the most eagerly awaited biopic this year — that credit belongs to the Sanjay Dutt biopic Sanju — but the film based on the life of Indian hockey star Sandeep Singh is definitely one to watch. Like Sanju, this biopic is no ordinary one, in the sense that the life of both Dutt and Singh wasn’t just your average rags to riches story. The film features Punjabi film actor and singer Diljit Dosanjh in a star turn as the young hockey player, and its clear, from the very beginning, that this is the role of a lifetime for Dosanjh. Dosnajh plays the athlete with sensibility, making him a brazen mischievous, vulnerable and strong character. Indeed, Dosanjh’s performance is the strong suit of an otherwise average film. Soorma handles the life of Sandeep Singh deftly. The film details his early interest in hockey and how it dissipated due to an abusive sports teacher before resurging after he falls for a women’s hockey team player Harpeet (Taapse Pannu) who encourages him to return to the turf. Honing his natural skills, he becomes the gifted athlete that he was destined to be, helping India’s national team become better than ever. That is, until tragedy befalls him, and he is paralyzed from the waist down when a police officer accidentally shoots Singh. Just when Sardeep Singh has prepared himself for a life away from a sport which he loves, his brother Bikramjeet (Angad Bedi, a standout in this film) helps Sandeep slowly regain his strength and get back on the field. The first half of the film where we watch Sandeep grow into his own and become a great hockey player is pretty great. But after his freak accident the film isn’t very incident in exploring the internal struggle of the player and chooses to skim through all that in a way that damages the film, when in fact, it could have connected the viewers to the Sandeep. It’s also nice to see a hero who isn’t really heroic as much as he is ordinary. Sandeep is depicted as more naive and sensitive than macho or tough, and this not only separates him from the kind of heroes we usually see in Bollywood films, it also helps us relate and empathize with him more. Other actors put in some good work too, Taapse Paanu doesn’t have the best material but she’s able to be charming and likable. She even seems natural in the scenes in which she plays hockey, which makes her role all the more effective. But call it lack of chemistry or just bad writing, their relationship seems unnatural and even a bit awkward. That said, the film does manage to end their story in a memorable way, which is something to be excited about. Danish Hussain and Satish Kaushik put in fine performances too but it’s Vijay Raaz, the coach of the team, who manages to outshine other supporting characters with good acting and some great lines. The film is weak in other areas. After a solid first half, the film stumbles and never seems to find its footing. The movie falters in developing Sandeep Singh’s motivations in the second half, particularly his love for hockey. After all, it is established very early on that him joining the men’s national hockey team has more to do with him earning the approval of his girlfriend and his girlfriend’s brother, than with the actual sport itself. So Soorma doesn’t allow us to understand exactly why the sport means so much to him all of a sudden. Despite the real life Sandeep Singh and his brother managing the choreography of the hockey matches, the movie can’t seem to make them look interesting. The match scenes are badly shot and aren’t the best feature of the film which is a shame. The soundtrack of the film is serviceable but not memorable. Soorma isn’t the best biopic you’ll see this year, but it is certainly the more honest of the two. Aside from weak execution in its latter half, the film is certainly good enough to be categorized among the best Bollywood films of the year so far and is worthy of a watch.